Welcome to the very first Digital Digest for 2012! It has been a shortened holiday week, so we don't have a whole lot of news for you. However, we do have one upcoming release news item, a look ahead at the releases for next week, and a review of Hawaii Five-O - The Twelfth and Final Season. But since it is a slow news week, we've got a few interesting international TV-on-DVD news items for you this week! Let's get going! Coming off of a holiday week, the news this week has been very slow, but we do have a few pieces of news this week. The first is the completion of the classic series Night Gallery. The series only aired for three seasons, but Universal has been releasing the seasons at a rate of one season every four years since 2004. With the first season released in 2004, second season in 2008, it would only make sense that 2012 would be the year for the third season, right? Right, indeed! Look for the Night Gallery - Season Three to hit store shelves from Universal on April 10. We've talked about international DVDs on here several times around the time we started Digital Digest, but we haven't really covered them too much. Of course, that is mostly because most of our readers are based in the United States, and because it isn't very common that other countries get releases of DVDs that we don't get in the United States. But there are a few releases in the United Kingdom in the upcoming weeks that we felt were worth mentioning. First, to cover base with the sitcoms, Revelation Films is releasing Doogie Howser, M.D. - Season One on February 1. This series has been released in the United States by Anchor Bay, but it is now out of print. On March 5, the same studio has their release of Chicago Hope - Season One, which has never even been released in the United States. But what I think is the most interesting release is coming from Revelation Films on January 23, with L.A. Law - Season One. This series hasn't made it to DVD in the United States, and with a few exceptions (most recently on the network formerly known as ALN), doesn't seem to get a lot of airplay even. It doesn't stop there, though. FremantleMedia is releasing The Practice - Complete First and Second Seasons in the United Kingdom on February 27. Oh, and as a side note, while we're still waiting for the sixth season of Dynasty in the United States, Dynasty - The Sixth Season can already be purchased in the UK, and you can even get it shipped for under $20 (converted to US currency)... less than the cost of half of a season in the United States! If THAT isn't enough, there is even MORE for you coming January 30, with Dynasty - The Seventh Season! It is very important, though, that everybody understands what is involved in purchasing such DVDs. You can't just buy such DVDs and pop them in your player in the United States and enjoy the show. It'll require that you change the region code on your DVD player, which does come with risks if you aren't really sure what you are doing, or to purchase a DVD player that is region-free straight out of the box. You can find more information on this here. Tuesday (January 10) is another light day for releases, with only one sitcom release. From Shout! Factory, we get the fourth (and final) season of the classic series Dennis the Menace, with Dennis the Menace - The Final Season. The great folks at Shout! Factory were kind enough to send us a review copy of this set, and you can read our review here. Additionally, CBS DVD finishes off a classic crime drama that aired in parts of three decades with their release of Hawaii Five-O - The Twelfth and Final Season. CBS DVD has always been very consistent and generous in providing us with review copies of DVDs (we definitely appreciate that), and we have a review of it today in Digital Digest. Finally, Universal has Columbo - Mystery Movie Collection: 1994-2003. Unfortunately, review copies were not made available for this set. All good things come to an end, and after twelve years of airing on CBS, so did the classic series Hawaii Five-O in the year 1980. Now, you can relive that final season of the classic series with the release of the season on DVD, finally bringing all (except for one "banned" second season episode) episodes of the series to DVD. 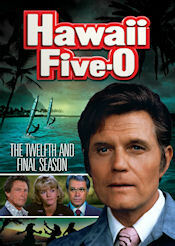 Though the twelfth season brought some changes to the series that ultimately ended up causing the series to be canceled (rather than make a graceful departure on top), it is still a fascinating season that culminates in a showdown between Steve McGarrett (Jack Lord) and his nemesis. The season begins with the double length season premiere, "A Lion in the Streets," where an upcoming union may result in street warfare. In "Who Says Cops Don't Cry," a female officer's husband is murdered and she is determined to get justice, no matter what. An exclusive sporting club is hunting more than just animals in "Though the Heavens Fall." Kumu mobster Tony Alika sets out to frame and embarrass Five-O in "Good Help is Hard to Find." In "Image of Fear," a woman claims she is being stalked, except nobody believes her. Two surfers rob a shop using a gun responsible for a trail of death in "Use a Gun, Go to Hell." In "A Shallow Grave," a college student has visions that lead him to the site of an old bank robbery and murder. The packaging for this set is very similar to the previous releases. First, we have an outer cardboard sleeve with McGarrett and the other characters, with some episode snapshots on the back. Inside the cardboard sleeve, there is a Viva case, with the exact same artwork. Inside the case, there is a listing of all of the episodes, by disc, along with episode descriptions and original airdates. The set contains five discs, all of which have the series logo on a gray background. Disc 1 contains three episodes (including the double-length season premiere), while all of the other discs contain four episodes each. Nothing has truly changed about the packaging this time. We still have the Viva case inside of the cardboard sleeve (both of which have the exact same artwork). Once again, the cover features a large photograph of McGarrett, and smaller photos of other cast members, and we have a few episodes snapshots on the back, along with a brief description of the series in general. Inside the case, you'll find descriptions and original airdates for all of the episodes. The disc artwork is basically just the series logo on a gray background, like all other CBS Home Entertainment releases. The menus for this series have pretty much stayed the same all throughout the series. The main menu has a large photo of Steve McGarrett, with a slideshow of videos playing in the background. Also, the theme song plays in the background. From the main menu, you have options of Episodes and Subtitles. Episodes just gives you a list of episodes (with no Play All option), and Subtitles lets you turn on the English subtitles. Chapters are placed throughout every episode. I think that these episodes look and sound better than some of the previous sets have looked. Of course, considering that these episodes aired in the 1979-1980 season, as opposed to the 60s, has a lot to do with that. The episodes have also been very nicely digitally restored, as most of the rest of the series has been (although the digitally restored version of the tenth season didn't make it to the tenth season DVD set). The audio is a loud and clear mono track, and English subtitles are available. There are two special features on this set, but one of them is very short and the other is, well, honestly hardly even worth calling a special feature. We'll talk about the worthy one first. The series promo (0:30) is just a short promo for the series from when it originally aired on CBS. The other special feature, "Crime Wave" (2:51) is nothing more than a promo to buy the seasons of the series on DVD. You get a rap song, some clips from the shows, and pictures of the season set boxes riding a surfboard. Honestly, I feel like I wasted three minutes of my life sitting through this feature. It is great to see this series come to an end, even if the final season isn't quite as great as the seasons leading up to it. It is especially great considering that the series has typically been split into various packages in syndication, making it difficult to see many of the episodes since they originally aired. Of course, we still only have about 99.9% of the series, since the episode "Bored, She Hung Herself" is still not available on DVD or for broadcast on television, but considering that the episode only ever aired once, I doubt that many people are truly missing it. So, will a complete series release of this series be up next? It would be an awfully large set to take on, but it could be done. I'm not sure what they could offer to entice fans to purchase it, though. In the meantime, I think fans of the series will enjoy the twelve releases that we have been given. Brady World (www.bradyworld.com) - This website is, as the name suggests, about the story of a lovely lady, a man named Brady, and all six of their kids, but it really is just much more than just the basics about the classic 70s TV series. Brady World, while it is definitely one of our more low-tech and low-frills choices for Click of the Week, really is one of the best sources out there for all things Brady. Of course, you'll find a decent episode guide for the series, The Brady Bunch. But what about the many, many series related to the original series, such as The Brady Brides, The Brady Kids, and The Bradys? Well, you'll find episode guides for all of those too. But we don't pick sites as Click of the Week just based upon episode guides, even though that IS an important qualifying factor. Among other content items that you'll find here are links to watch complete episodes of guest appearances of Brady stars in other series, fan stories (not fan fiction, but actual stories of fans meeting the cast members), history, memorabilia, and even up-to-date information on where you can see the series, as well as the stars of the series, in the upcoming weeks. So, not only should it be your Click of the Week for this week, but if you are a Brady fan, it should be your Click of the Week every week!